An east London man has been named as the UK's first grand master of the number game Sudoku after winning the national championships. 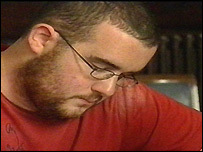 Edward Billig, 23, of Wapping, beat thousands of people to the title after reaching Sunday's final in St Paul's. Sudoku involves solving a number puzzle of nine boxes but experts say logic, not mathematical skill is the key. Mr Billig won £1,000 after beating 120 semi-finalists and 10 finalists by completing the puzzles the fastest. Mr Billig, who studied music and sound recording at university, says he started doing the puzzles when they were first published in a newspaper. He and a friend then started comparing how quickly they could solve the puzzles. He said: "I'm not really sure why I'm good at it. I've got quite a logical mind. "I was quite good at maths at school. My Dad's a maths teacher and my brother did maths at university but it's more logical stuff." Mr Billig, who works as a transcriber and plays guitar in a band, said he was "shocked" to win the money but that it "would come in handy". The competition was organised by The Independent newspaper.